Bruce Joins Cast Of New Animated Film 'Meetballs"
Variety reports that James Caan, Andy Samberg, Bruce Campbell, Mr. T, and Tracy Morgan will also lend their vocal talents to the project, a planned 3-D film that is currently scheduled for a January 15th, 2010 release. Set in a town where food falls from the sky, the toon will feature SNL's Hader as Flint Lockwood, "a young inventor who dreams of creating something that will improve everyone's life." Scary Movie starlet Faris plays Sam Sparks, a weathergirl who hides her intellect behind her perky exterior. The New York Times featured Bruce today and how he is recently being recognized by the mainstream audience through his show 'Burn Notice'. I have you say that this is the first time a remake got me excited since John Carpenter's The Thing and Chuck Russell's The Blob. 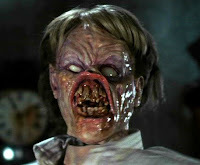 OK I'll cut to the chase, according to Bloody Disgusting they are planning to film Evil Dead the Musical in 3D. I truly don't know what to expect, but at least this look a lot more original that what ever Michael Bay has 'made'. MTV has released some information on the 'My Name Is Bruce' comic book that is going to be released soon. Click the link for more information and images. 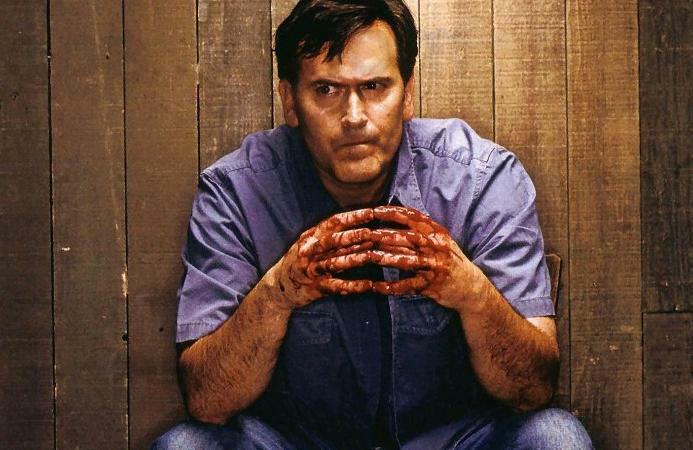 After numerous delays, the new Bruce Campbell movie, “My Name Is Bruce,” has finally announced an October release date, but for comic book fans, the first taste of the long-awaited film will come a month earlier. A one-shot comic book companion to the movie, written by Milton Freewater, Jr. and penciled by Cliff Richards, is due out on September 24th from Dark Horse Comics. Looks like Bruce will have two more 'Spider-Man' films to add to his collection. News hit today that Spider-man veterans Tobey Maguire and Sam Raimi have been locked in by Sony to return for back to back productions of Spidey 4 & 5. Well I can truly say that this is looking better and better (though it's not hard to be less disappointing then Indy4 or Die Hard4 I guess). Go here and here where Raimi talks about ED4. "Well, it’s a bit of a tease but I must say that the truth of the matter is I couldn’t come to an agreement with the filmmaker about what type of film we wanted to make so we felt it was best, rather than jeopardize what I consider to be a good friendship, we let it go. So it fell apart and I don’t think it’ll come back together again." and if you go to Shock till you drop you'll see a new poster for MNIB (though it looks like a bad photoshop really). ok I guess that's most of what's happening lately (don't forget the post under this one), we really need to find a way to keep this blog alive (if it is actually still alive), though I don't have full control (Deckle has). So make yourself heared, if it's worth it to find a good way to keep the BC info comming. Ok it's been a while. I for one have been busy with school and working on other websites. but it's seems people still visit this site. I guess it's maybe an idea to do a restart with this blog or maybe go elsewhere, not to mention expand the community, so that everybody can add BC info. so if anyone has any suggestions I'm all ears. Anyway I haven't heard anything from Deckle either so maybe he's out, I dunno.
" As of a few weeks ago, all the funds are there to make it on a low budget, no frills level. But the main producer is currently producing something else that doesn’t get out for a month or so, and Bruce Campbell is not actually acting but he has a producer credit on the big budget Hollywood remake of The Evil Dead. I’ve spoken to him and I know he’s up for it, but I know that this is insignificant money-wise compared to the Evil Dead remake, which will steamroller us if we get in the way. It’s basically a question of juggling our dates to survive." The thing is that, according to a friend of mine whose been to the San Diego ComicCon, the Evil Dead remake has been dropped (Groovy) in favour of [hold on to your butts...] EVIL DEAD 4. Sorry I don't have a link to prove it, but I trust my friend and according to him Raimi said this himself and not as a reaction to some annoying fan. OK that's it for now. I'll have a look for some more tidbits tonight. SEOUL -- "Evil Dead: The Musical" may not have been a killer hit Off Broadway, but it's slaying them in South Korea. The campy Canadian musical based on Sam Raimi's cult slasher films is packing them in at the Chungmu Art Hall Theater, where it opened March 19 and is scheduled to run through June 14. According to lead producer Jeffrey Latimer, various representatives of the Japanese market are negotiating for the property, while a German production also has been signed for later this year. Back in Toronto, where the musical gorefest began in 2003, the show reopened for the fifth time on Feb. 14 and has just been held over into summer. So how does a show that failed commercially in Gotham manage to spin out a life halfway around the world? There are a couple of explanations. One is the fact that Korea is, quite simply, crazy for musical theater. "The passion for musicals in Korea is unbelievable," says Adam Gentle, international licensing manager for the Broadway Asia Co. "There were 160 individual musical productions produced last year in Seoul. Our company alone grossed $28 million from this city in 2007."